I remember one of the first things said to me during my first pregnancy scan: “Well, there’s only one in there.” I was taken aback. Whoa. I hadn’t actually considered I might have more than one bub at once. It got me thinking, especially after my daughter was born, just how different life would be with two (or more!) babes in my arms. Curious too? Come take a look. 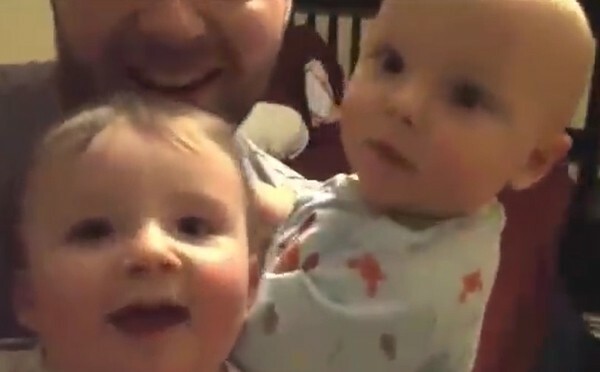 The first video of a father dressing his twins to get them ready for bed, is more like a slapstick comedy. While quickly trying to dress the first, the second refuses to stay put, constantly moving toward the edge of the bed. It’s a good example of how parents learn – very quickly – to multi-task. Especially with two babies in the picture. For more multiple mischief, have at look at our post of these tricky twins trying to fool their mum at bedtime. It’s too cute. Is getting the troupe dressed the hardest? What do you find to be the trickiest part of having multiples? We’d love to know, so drop us a line.